The group of 2,235 men who consistently followed four or five of these healthy behaviors experienced a 60 per cent decline in dementia (Alzheimer's) and cognitive decline. Is it possible to delay the onset of Alzheimer's or a related dementia? Consider this simple statistic - if there were a way to prevent the onset of Alzheimer's by 5 years the number of people currently living with Alzheimer's would be cut in half. You read it right - reduced by 50 percent. Lets just be straightforward. The statistic I am using here cuts across all of those living with Alzheimer's. And the simple fact is, harsh as it may sound, half the people living with Alzheimer's would have died before they were ever diagnosed with the diseases. Now I know you are going to be prone to say - my loved exercised, my loved one did this or that, and still ended up living with Alzheimer's. I know where you are coming from. But lets face it - very few people really live a fully healthy live style. And, a growing number of people are now living with Alzheimer's. The researchers followed these men for 35 years. Many of them are very old. And, the rates of dementia in this group are down by 60 percent. The study found that dementia could be delayed by 12 years and heart disease by six. So I would suggest you think about this. Do you know someone that is worried about getting Alzheimer's? I mean really worried? Do you and your loved one's really want to do something to prevent Alzheimer's? Or, are you just going to sit back and let the chips fall where they may? Everyone gets to choose. I bet a lot of people would choose the same path that these 2,235 men are on. Consider sharing this article and information widely with family and friends. If you have a Google+ account press the button at the top of this article and share it. Or, use the Facebook button. Read on and give this some serious thought. Think about sharing this information. You might change the life of someone you love. has found that exercise significantly reduces the risk of dementia. taking regular exercise, non-smoking, a healthy body weight, a healthy diet and a low alcohol intake. as well as 70 per cent fewer instances of diabetes, heart disease and stroke, compared with people who followed none. 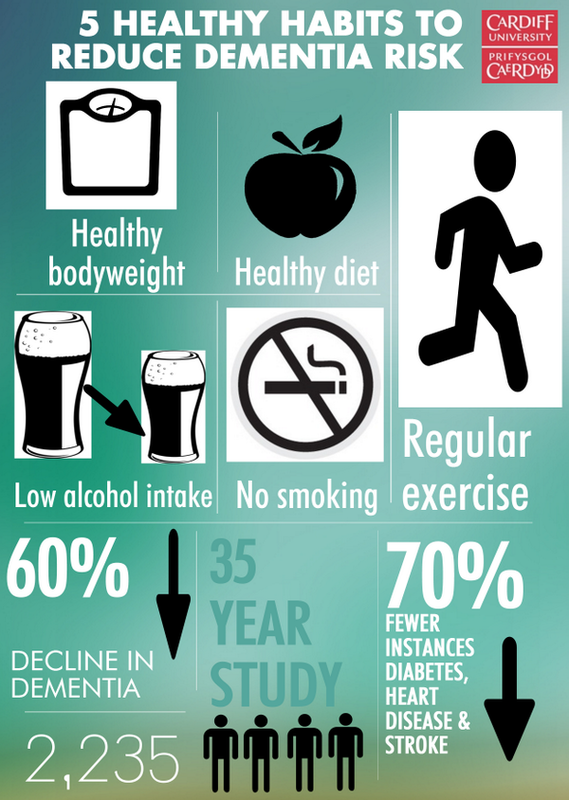 The study identifies five healthy behaviours as being integral to having the best chance of leading a disease-free lifestyle: taking regular exercise, non-smoking, a healthy body weight, a healthy diet and a low alcohol intake. The people who consistently followed four or five of these behaviors experienced a 60 per cent decline in dementia and cognitive decline - with exercise being the strongest mitigating factor – as well as 70 per cent fewer instances of diabetes, heart disease and stroke, compared with people who followed none. "The size of reduction in the instance of disease owing to these simple healthy steps has really amazed us and is of enormous importance in an aging population," said Principle Investigator Professor Peter Elwood from Cardiff University’s School of Medicine. "What the research shows is that following a healthy lifestyle confers surprisingly large benefits to health – healthy behaviors have a far more beneficial effect than any medical treatment or preventative procedure". "If the men had been urged to adopt just one additional healthy behavior at the start of the study 35 years ago, and if only half of them complied, then during the ensuing 35 years there would have been a 13 per cent reduction in dementia, a 12 per cent drop in diabetes, six per cent less vascular disease and a five per cent reduction in deaths." "This large study further underlines the importance of a healthy lifestyle, and provides yet more evidence to indicate that healthy living could lower the risk of dementia. We still need more research to understand how to prevent dementia – which is why Alzheimer’s Research UK is investing in this area – but it’s encouraging for people to know there are simple steps they can take now to reduce their risk of this devastating condition. We are facing potentially large increases in the numbers of people living with dementia as the population ages, and if we are to deal with this crisis head on we must invest in research."